On the eve of a planned Equality March through Kyiv, the leader and other members of the Ukrainian ultra-nationalist Right Sector party have come out with anti-LGBT and anti-western statements identical to those regularly churned out by their ideological opponents in Russia. 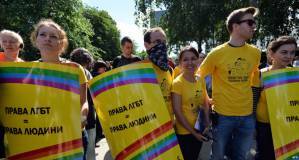 The homophobic utterances and call for the march to be banned come a week after attempts in Moscow to hold an ‘unauthorized’ march resulted in participants being attacked in full view, but without reaction from the police, and three activists being sentenced to 10 days imprisonment. There have been attempts in Ukraine to bring in a law similar to that now in force in Russia banning so-called ‘propaganda of homosexuality”, but these have thus far failed. There have, however, regularly been problems, particularly with holding similar marches in previous years. In 2012 the planned Kyiv Pride march was cancelled by the organizers due to threats of violence from far-right groups and the refusal of the Kyiv police to guarantee proper protection. The police initially promised to provide such protection in 2014, but then withdrew the promise and the planned Equality March was again cancelled. Amnesty International in Ukraine reacted early this week, calling on people to write to the Kyiv authorities demanding that they take appropriate measures to ensure the safety of participants in the Equality March planned for June 6. At the same time, Right Sector has issued an appeal to the Mayor of Kyiv, Vitaly Klichko asking that the march be banned. The letter claims, without providing any evidence, that “the public are very negative in their attitude to such LGBT actions. Most Kyiv residents are believers and against such a phenomenon.” After other arguments that do not bear scrutiny, it ends by pointing out that there are soldiers at present in Kyiv “who may not accept LGBT parades” and to avoid “provocation, conflicts and unpleasantness of any kind”, Right Sector asks Klichko to apply to the court for a ban. Volodymyr Parasyuk, who played a major role in Euromaidan and is now an MP, not only says that he supports the Right Sector call for a ban but suggests that all members of the LGBT community who gather for the parade should be taken to the ATO [anti-terrorist operation] zone. He argues that “gays” should be defending their country and that such actions are inappropriate in wartime. Doubts about expediency may well be shared by people who would otherwise fully support such events. Not so, however, the rest of Parasyuk’s remarks on the subject. Speaking as self-styled expert on “the Ukrainian people”, he says that they should not adopt all European values. “The Ukrainian state has certain moral and religious vectors. Nobody carries out any repression. The state simply does not allow any immoral actions and I believe that that’s correct. In my opinion, with regard to that, Europe has a lot of problems”. He too suggests that such events are inappropriate at a time of war, however goes on to say that “members of the military-political movement Right Sector will be forced to divert their attention from other matters in order to prevent those haters of the family, morality and normal ideas about human beings from carrying out their plans. We have enough issues, however circumstances force us to turn our attention to that evil as well”. After asserting that most Ukrainians are Christians, and that they and representatives of other religions view homosexuality as a sin and psychological illness, Yarosh goes on to repeat other standard phrases used by those championing anti-LGBT legislation in Russia. He says, for example, that they will not allow “a bunch of people living off grants, and several hundred “useful idiots” to foist their ideology on millions of Ukrainians”. He claims that via various organizations and programmes, the West is seriously pressuring the government in Kyiv to “force them to introduce LGBT ideology more actively”. “Let’s think, does Ukraine need such European integration when somebody is foisting their will on us? We are not fighting Moscow’s imperialism so that somebody else tells us what to do – we are fighting for our freedom!”. What exactly this ‘ideology’ he talks of is supposed to entail is difficult to pinpoint, unlike other aspects of European integration, such as the rights to freedom of peaceful assembly and of expression. Yarosh and Parasyuk who both entered parliament last year through single mandate constituencies, as well as the Right Sector movement are proposing that the Kyiv authorities breach Ukraine’s Constitution by banning a peaceful event, something that their predecessors under former President Viktor Yanukovych did with depressing frequency and, during Euromaidan, with increasing violence. Yarosh is also effectively repeating the threats of violent suppression made in more open and sinister form by members of the far-right Tryzub party (one of the parties within Right Sector). All of this in the name of “the Ukrainian people” whom he and his political allies claim to be speaking for and protecting from European ‘perversion’.